Old Dr Pemberton made patent medicines, such as Globe Flower Cough Syrup, Gingerine and Extract of Stylinger, which people took hoping they would make them feel better. Then, one day in 1886, Dr Pemberton decided to try making a new drink, a tonic which would be especially good for hangovers, and for the nerves. He mixed essences, extracts and oils and took the mixture down to his friends at the local soda-fountain in Atlanta, Georgia (see panel below for background to Soda-fountains). Asa Griggs Candler wanted to be a doctor but did not get far in his training; he became a pharmacist, working in an Atlanta store. He married his boss’s daughter and was doing quite well when he drank his first Coca-Cola and decided it had possibilities. Old Pemberton’s invention hadn’t been very successful. 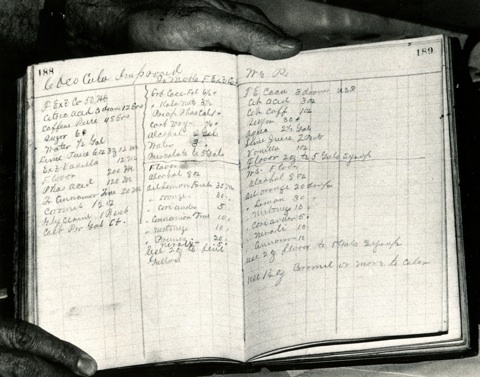 The first year he sold only twenty-five gallons of Coca-Cola. Then he sold most of his shares in the invention for $283.29, and two years later he died. Candler bought up all the scattered shares easily because no one thought they were worth anything. Six years after Coke’s invention, Candler, the farmer’s son, trained pharmacist turned businessman, owned all the shares in Coca-Cola and set about really selling the drink. 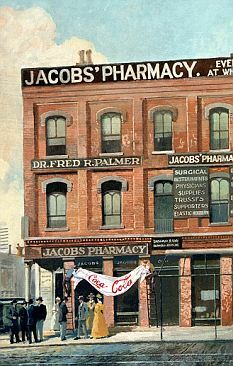 Coca-Cola syrup began to be produced by the barrel-load at the factory in Atlanta. Candler decided that advertising was more important than anything else, and Coca-Cola signs began appearing on walls, in shops, magazines and soda-fountains, on awnings and glasses. In 1899 two baseball fans Benjamin Thomas and Joseph Whitehead of Chattanooga, Tennessee decided it was a great pity they couldn’t have their favourite drink right at the game, instead of waiting to get to a soda-fountain where an attendant had to mix it. They traveled to Atlanta and asked Mr Candler if they could have the right to put Coca-Cola in bottles and sell it. Candler agreed and went on making Coca-Cola syrup while others worked at bottling and distribution. It was wonderfully easy stuff to make. And it was extremely profitable. The two baseball-loving bottlers made fortunes, and soon Candler himself was a multi-millionaire. All kinds of imitations and alternative soft drinks were put on the market, over a thousand of them. 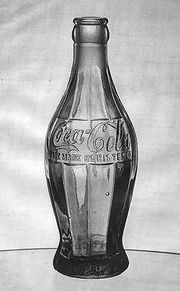 So in 1916 the iconic contour bottle, so distinctive it could be recognised in the dark, was introduced to distinguish Coca-Cola from competitors. In 1919 Candler sold the company for twenty-five million dollars. The new owners went on expanding sales and making more millions of dollars. In 1923 it was again sold this time to Ernest Woodruff. He gave Coca-Cola to his son, Robert Woodruff, who would be president for six decades. Under his leadership Coca-Cola expanded even further. Today it is the most popular soft drink in the world. And is the most widely advertised product in the world. The advertising always emphasizes that Coke is a wholesome, clean living drink, for every member of the family. When America joined in the Second World War the head of the company declared that no serviceman anywhere should ever go thirsty for a Coke. One of the first jobs after the United States armed forces established beachheads in North Africa and France was the construction of Coca-Cola bottling plants. Coca-Cola is always thought of as an especially American drink. Yet in 1964 seventy-five million Cokes a day were downed in 127 different countries. 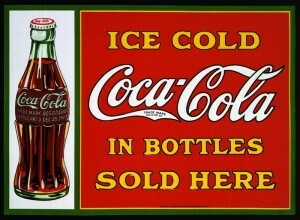 In 2010 Coca-Cola sold 1.6 billion drinks everyday in more tha 200 countries. Of these, beverages bearing the trademark “Coca-Cola” or “Coke” accounted for approximately 78% of the Company’s total gallon sales. Coca-Cola has continued to develop other drinks and acquire other brands world wide. In July 1982 a brand new product ‘Diet Coke. Within two years, Diet Coke had become the top low-calorie soft drink in the world. However it’s development lead the company into one of the greatest marketing blunders of all time. In 1985, and after the release of the successful new Diet Coke product, The Coca-Cola Company made what has been known as one of the biggest marketing blunders ever. They stumbled onto a new formula in efforts to produce diet Coke. They then decided that the new formula should replace the original. The change to the world’s best selling soft drink was heard by 81 percent of the United States population within twenty-four hours of the announcement. Within a week of the change, 1,000 calls a day were flooding the company’s eight hundred number. Most of the callers were shocked and/or outraged, many said that they were considering switching to Pepsi. Within six weeks, the eight hundred number was being jammed by 6,000 a day. The company also fielded over 40,000 letters, which were all answered and each person got a coupon for the new Coke. Many American consumers of Coca-Cola asked if they would have the final say. When Pepsi heard that the Coca-Cola company was changing its secret formula they said that it was a decision that Pepsi tastes better. Roger Enrico, the president and CEO of Pepsi-Cola wrote a letter to every major newspaper in the U.S. to declare the victory. Coca-Cola management had to decided however to press on with the new formula. However 87 days after the new Coke was introduced, the old Coke was brought back in addition to the new one. This was greatly due to dropping market share and consumer protest. The market share fell from a high of 15 percent to a low of 1.4 percent. This was said to be a classic marketing retreat. Coca-Cola executives admitted that they had goofed by taking the old Coke off the market. The Coca-Cola company’s eight hundred number received 18,000 calls of gratitude. One caller said they felt like a lost friend had returned home. The comeback of old Coke drove stock prices to the highest level in 12 years. This was said to be the only way to regain the lead on the cola wars. Today New Coke or Coke II as it was later branded has disappeared. Soda-fountains had become popular in America as meeting-places where people could have a soft drink (‘hard’ meant alcohol) and something to eat such as an ice-cream. Soda-fountains had cool marble counter-tops and smart attendants to mix drinks. Soda-water had been invented by the famous English chemist, Dr Joseph Priestley, in 1772. Soda is basically distilled water charged with carbon dioxide gas, which bubbled and fizzed as it escaped. Ice-cream sodas were served at soda-fountains. They were invented in the city of Philadelphia in 1874, when an attendant dropped a dollop of ice-cream by mistake into a glass of soda, and someone discovered that it tasted good. Ice-cream sundaes were invented when ice-cream sodas were forbidden on Sundays in a town called Evanston, Illinois. So a soda-fountain owner got around the law by serving ice-cream with syrup instead of soda. Has the mysterious 7x been discovered ? Early in 2011 the internet blogsphere was alive with reports that the Coca-Cola secret ingredient 7X had been discovered The only official written copy is supposedly held in a U.S. bank vault and only two company employees at any one time are said to know the whole formula that gives the fizzy drink its distinctive flavour. But now, 125 years of near-total secrecy look to be over, as a website claims to have uncovered a list showing the ingredients and quantities used to make the drink. The list, it claims, was actually published without fanfare in a 1979 local newspaper article in Coca-Cola’s U.S. home town of Atlanta, Georgia – but no one appeared to realise its significance. The website, Thisamericanlife.org, said the 32-year-old article – buried on Page 28 of the Atlanta Journal-Constitution – shows a photograph of a recipe purported to be an exact replica of Coca-Cola creator John Pemberton’s. The image was blown up and the recipe decyphered.